Hi, friends! I’m back with a new top, a new haircut, and some fancy professional photos for you! I’ve had this Hot Patterns Metropolitan Gypsy blouse sewn up for several months but never could coordinate photos of it. When I scheduled a photo shoot for my stepson’s casual senior (!!!) 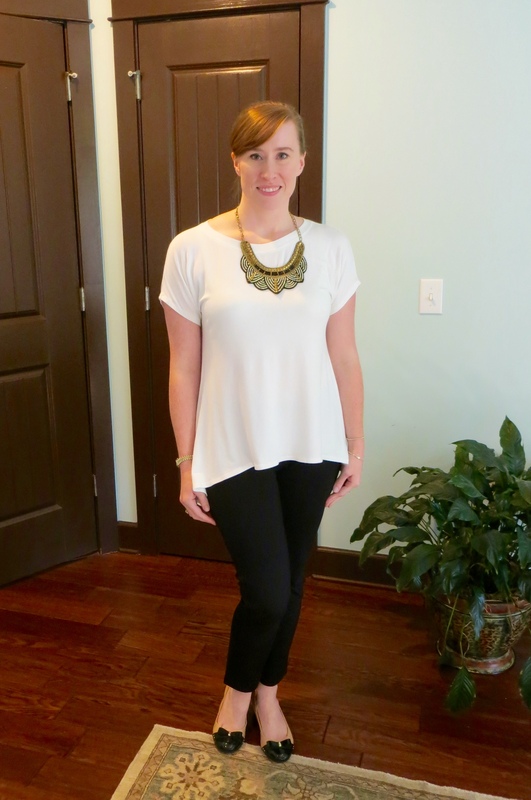 portraits, I had the photographer capture a few of my top to use on the blog. She did such a great job! Any locals looking for great wedding/family/baby/senior photographs, check out Haley Budlong. 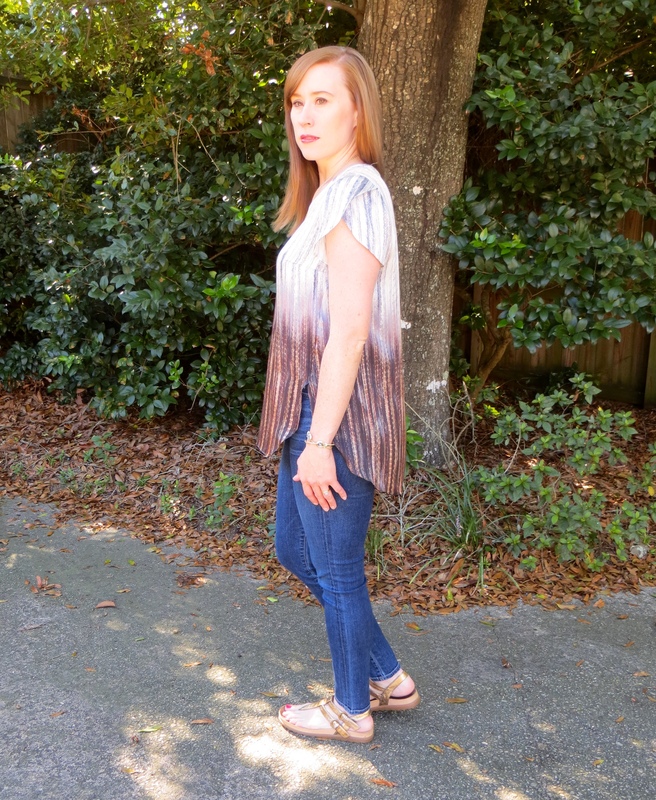 I was inspired by Erica Bunker’s version of this top so I just blatantly copied hers — with her permission, of course :-). This pattern is also a pretty accurate ringer for the Tibi off-the-shoulders blouse that retails for around $300. I checked one of these out in Nordstrom last month and I’m happy to report that it wasn’t constructed any better than mine. I cut a straight size 12 but probably could have gone with the 10. I omitted the shelf bra, although I may try it on the next version to see if it helps to keep the elastic down and prevent it from riding up on my shoulders. 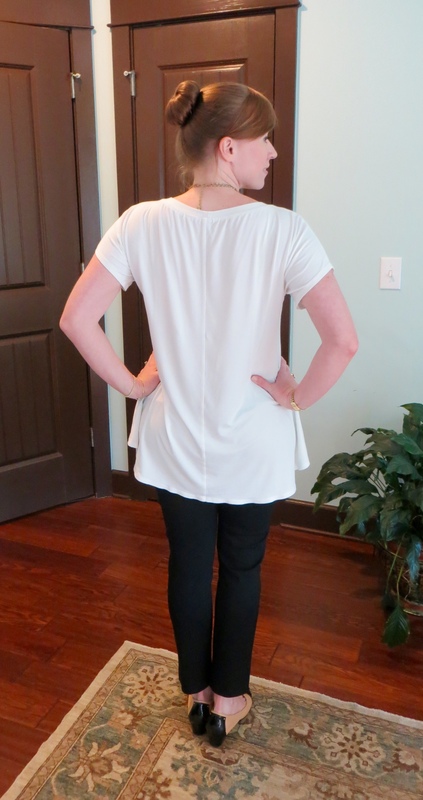 That being said, this top fits way better in the shoulders than any RTW off-the-shoudlers tops I have because I was able to select the right amount of elastic for my broad shoulders — 27″ to be exact, 3/4 of my shoulder circumference. My fabric was a lovely cotton French dot jacquard from Emma One Sock. 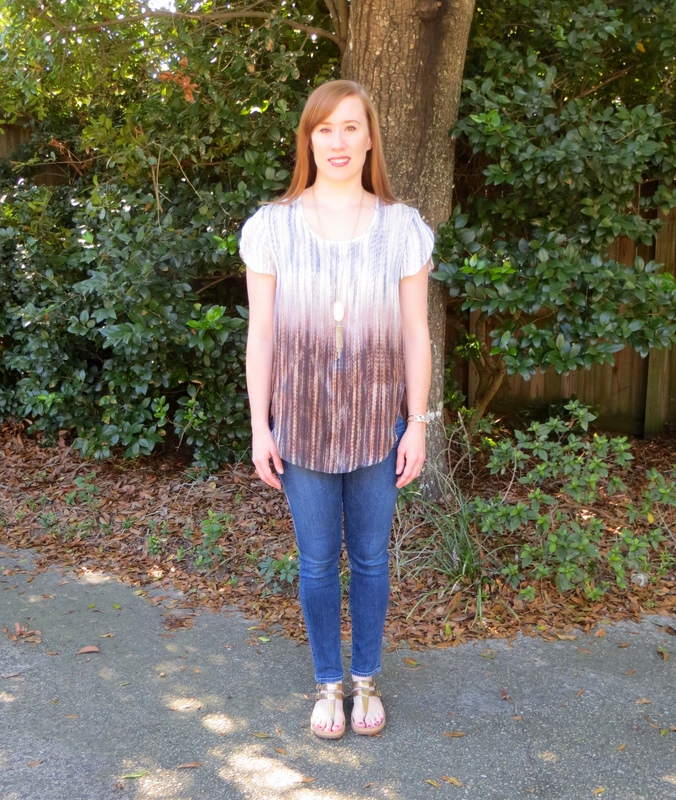 I was able to get this shirt out of less than 2 yards, much less than the pattern’s recommended 2 3/4 yards. The pattern sewed up quickly in a single Saturday and the directions were brief but sufficient. I would definitely make this again and have a gorgeous green snake print silk set aside for just such an endeavor. 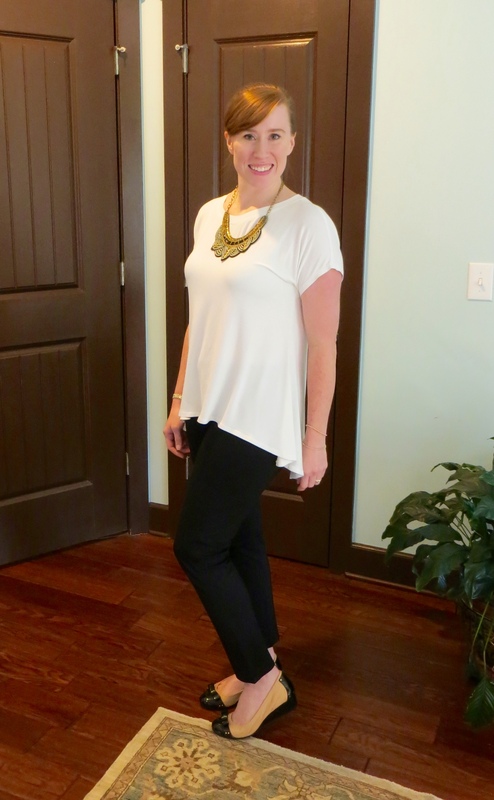 For this photo shoot, I kept my look simple and paired my top with my crisp white slim jeans, a Kendra Scott necklace and bracelet, and some tan platform wedges. What do you think about off-the-shoulders tops? 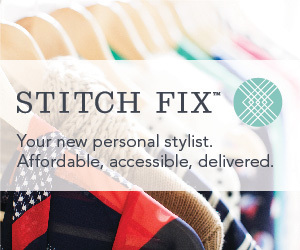 Would you wear or sew one? Hi, friends! Happy Hump Day! 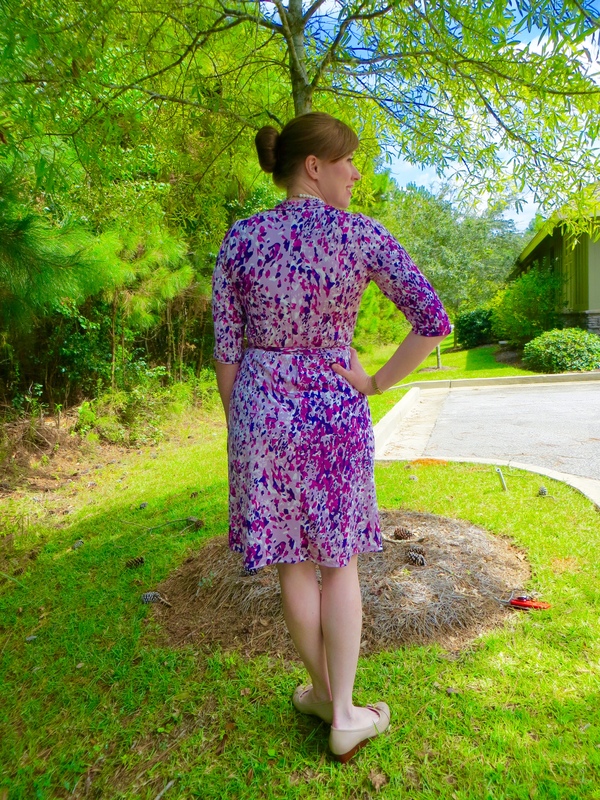 Just a quick reminder that today is your last chance to enter my giveaway for two Butterick patterns. To enter, leave a comment on my last post here or my Facebook page and tell me your favorite fabric and pattern to work with. I will close the giveaway tonight and announce the winner in a few days. 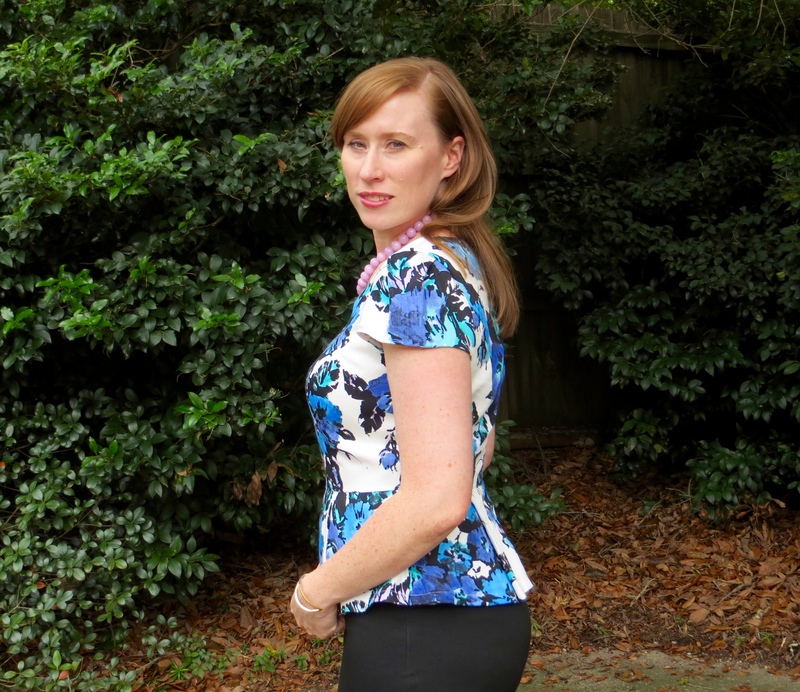 A little while back I shared with you my first version of the In-House Patterns Chelsea Blouse. My love for In-House Patterns is no secret on this blog. 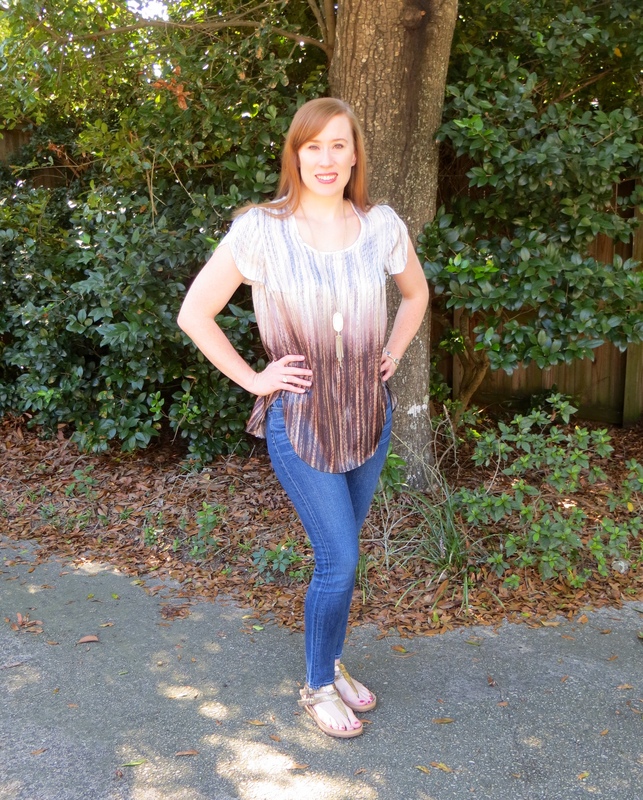 In my first version of the top, I told you the shoulders were a little wide, admittedly my fault because I added extra width to the pattern and cut a larger size than was probably needed. I knew I needed to give the pattern a second chance so here we are — take two. I sized down to a medium for this version and didn’t add any width to the shoulders. I think this time it is nearly perfect. I have concluded that one of my shoulders is wider than the other so I could probably alter my shirts for that, but on something this loosely fitting, I am not going to bother for now. 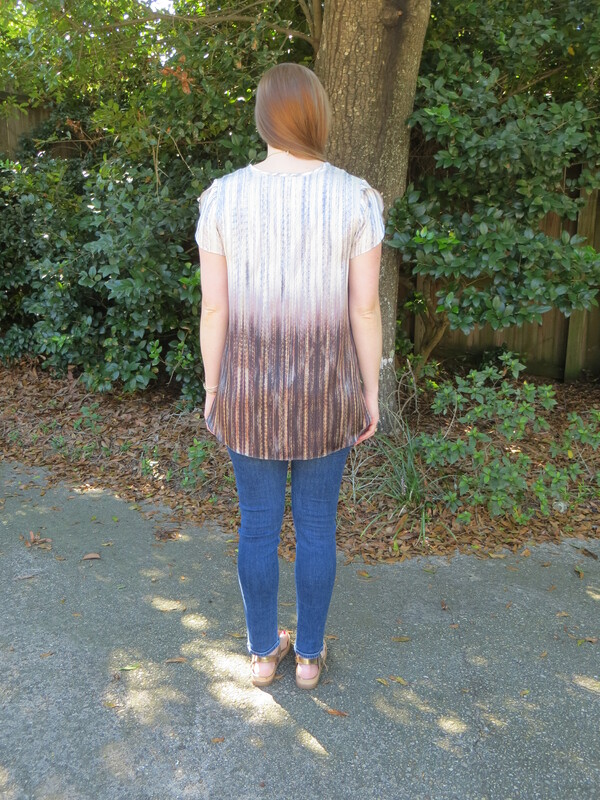 I sewed this up in a Theory silk charmeuse earthtone ombre panel that I purchased from Emma One Sock. The fabric is gorgeous in person and of course feels wonderful against the skin. I cut it out in a single layer so I could place the pattern like I wanted it. 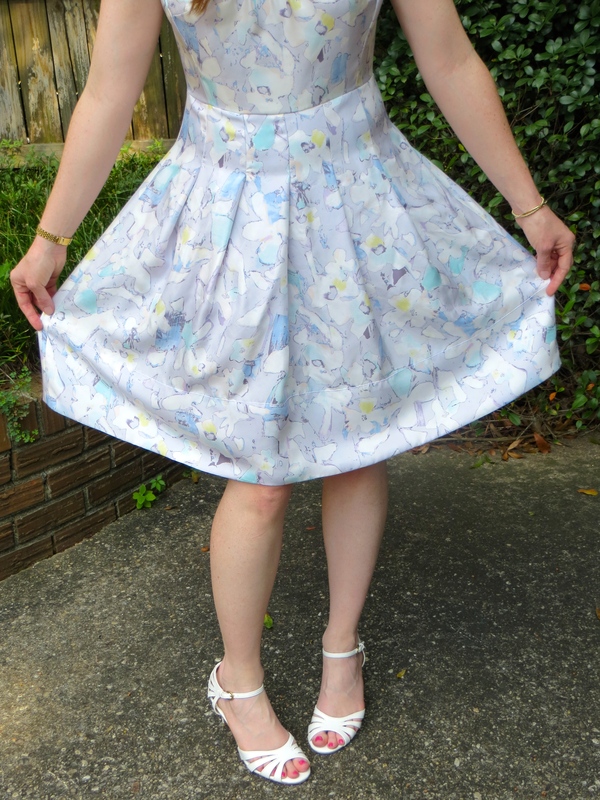 My only gripe with sewing it was with the rolled hem foot (again) and you can see how the hemline is a little wavy. I find the rolled hem foot makes my bias edges stretch out some. Is this operator error or just a problem with that hemming method? Either way, I will still be wearing my top as we transition from hot hot to less hot here in the Deep South. It pairs well with many of my bottom pieces and I can’t wait until it is actually cool enough to pull out some boots and booties! Howdy, friends! I hope your week is off to a good start. 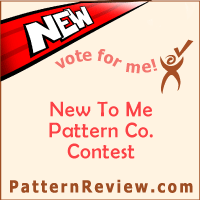 I have a completed sewing project to share with you today but first I want to give you an update to let you know that my entry in the Pattern Review Sewing Bee was selected to move on to the next round! You can see my entry for Round 2 here and I will get a post about it up soon (but I have to do some traveling for work first). I promised a giveaway if I moved on, so here it is. 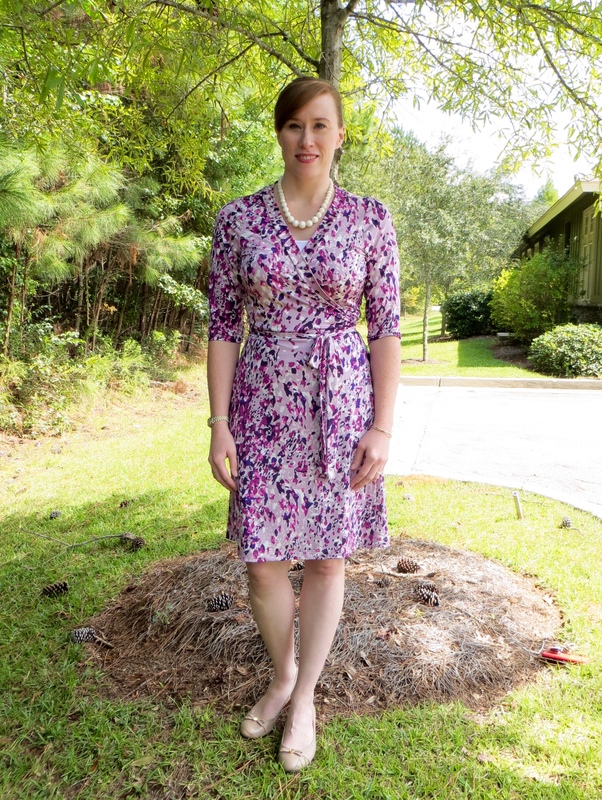 I have two Butterick patterns — 6019 and 5895 — both Patterns by Gertie. You can see my rendition of 6019 here. If you would like to be considered for the patterns, just leave a comment on this post below or on my Susie Homemaker, MD Facebook page. I will keep the contest open until September 30 at midnight CST. In your comment, tell me your favorite pattern and your favorite fabric to work with — they don’t necessarily have to go together. The contest is open to anyone 18 years of age and older worldwide. I will announce the winner within a few days after the close of the contest. Now on to this garment! I have always been a fan of wrap dresses. I think many of us love the iconic style first brought to popularity by Diane von Furstenberg several decades ago. There is something universally flattering about the forgiving knit dress with a surplice neckline and cinched wrapped waist ties. 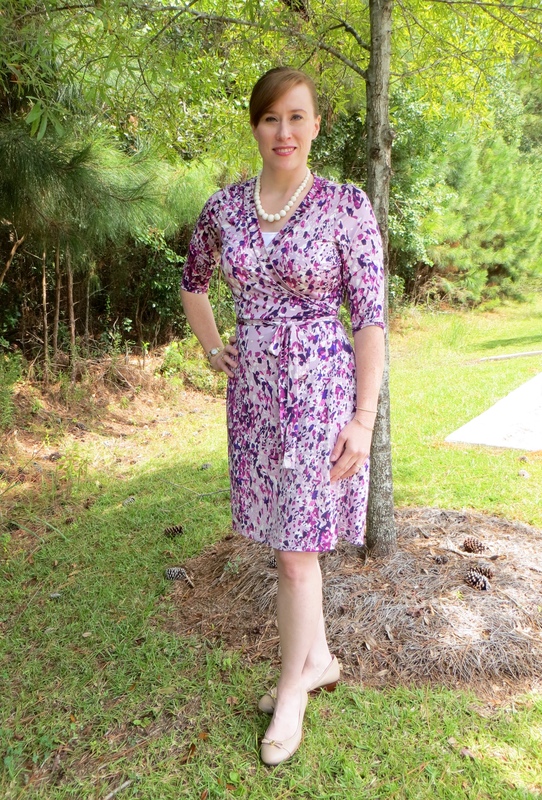 I have long searched for the perfect pattern or RTW wrap dress. I have even tried on and purchased authentic DVF dresses only to find that they are anything but perfect for my body. They don’t come anywhere near close to covering my bust which isn’t conducive to a flattering look. I have mocked up the popular modern Vogue 8379 but found the skirt to be too full. I have several other wrap style patterns in my stash but just haven’t had the gumption to sew any of them up. And a lot of cute indie wrap patterns have popped up on the market, too, but I have managed to resist. 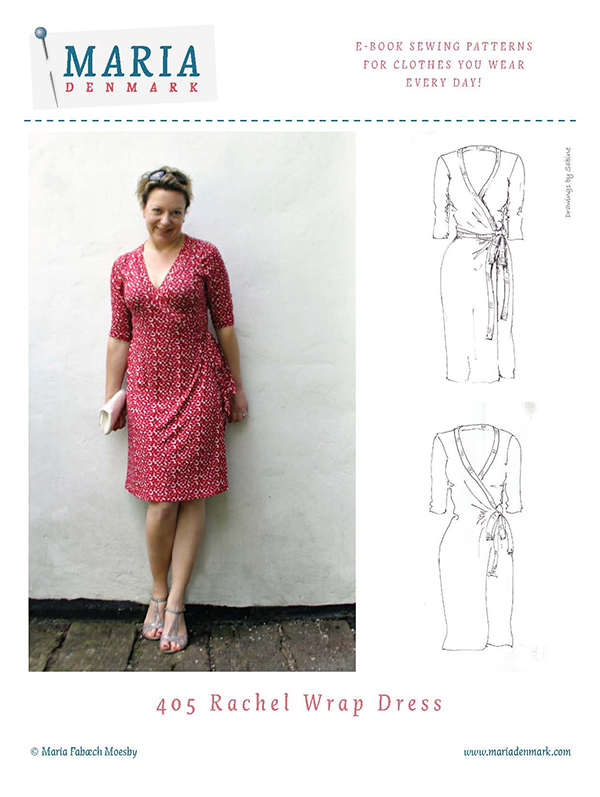 Until the Maria Denmark Rachel Wrap Dress came along. I am not sure why this dress won me over but it did and in a very quick fashion. I went from purchasing to printing to taping to cutting to sewing to wearing all in a matter of two days. That is unheard of in my world! 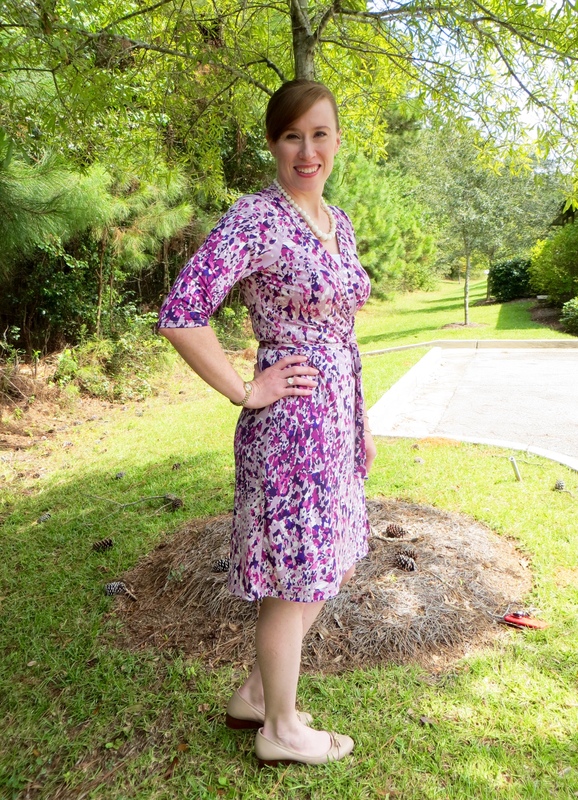 For my pattern modifications, I made an FBA since my biggest beef with wrap dresses is the gape-age in the bust. 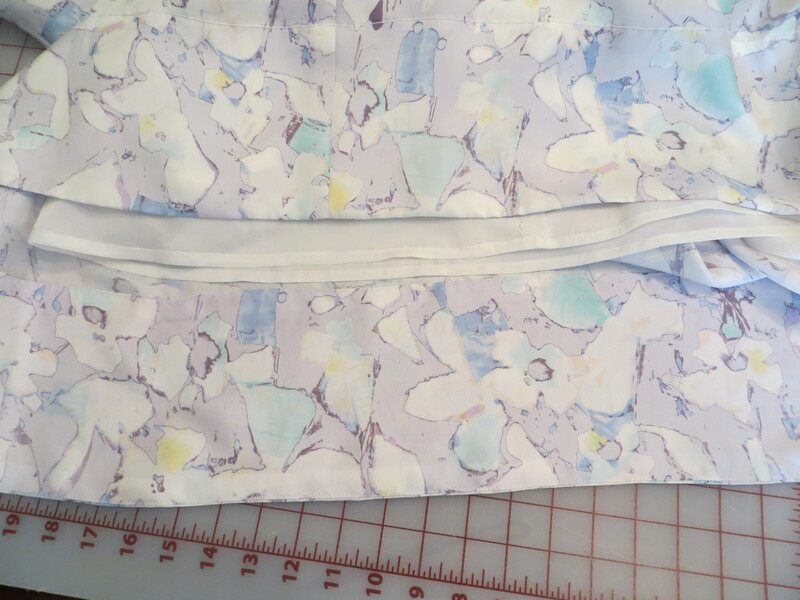 I created a side dart for a better fit and the added waist ease I removed at the side seam to keep the pattern true along the waist (there is no waistline so you have to cut the pattern in two to do the FBA then reattach the top and bottom). 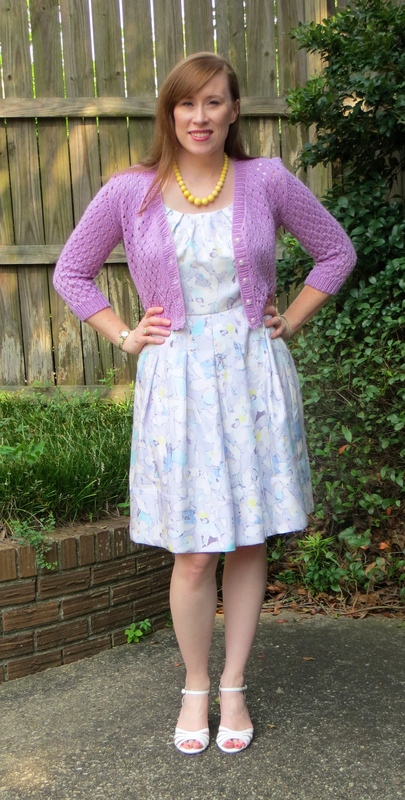 There is a FBA tutorial on Maria Denmark’s blog specifically for this pattern but I don’t recommend using it. 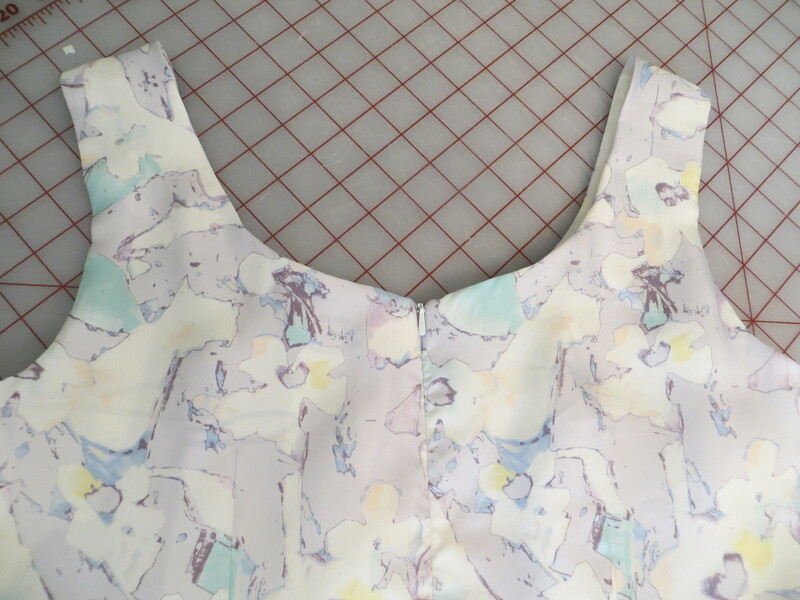 She gives you a method that results in all dart intake being transferred to a waistline seam but since this dress doesn’t have a waistline seam, you end up with a bodice that won’t match back up with the skirt after the FBA. So take my advice, if you want to do an FBA on this dress, do the usual Palmer-Plescht method, not the one on Maria’s website. My one other gripe with the pattern (well, other than the fact that it doesn’t include seam allowance, GRRRRR!!! ), is that the shoulders are cut really narrow. I added 1″ to get to what you see in these photos and I could probably stand to add another 3/4″ to get the seam to fall where it should. My shoulders aren’t that broad! But overall I do love this dress. I love the figure skimming skirt and the neckline-hugging wide neckbands. I also love that it only has 4 pattern pieces so it’s easy to cut out and assemble. Howdy, friends! I hope you had a nice Labor Day. While I had to go in to the office for a while today, I did get lots of sewing in this weekend. 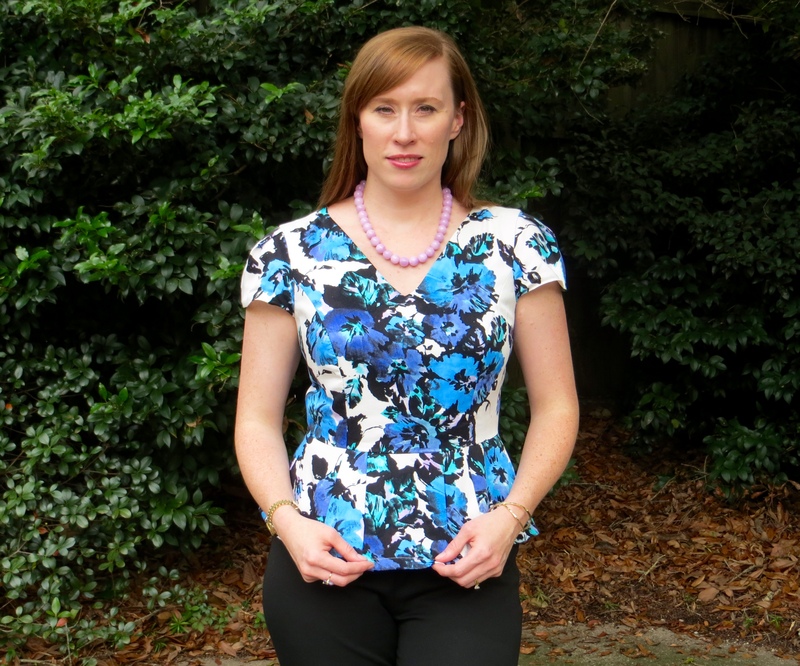 Have you heard about the Sewing Bee going on over at Pattern Review? 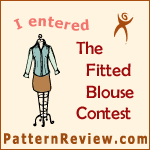 I didn’t think I would enter but then at the last minute, I decided I would move one of my to-sew objects up the queue and enter it in the contest. Let’s talk pattern first. I purchased Simplicity 1425 a while back. So long ago that I bought the wrong size pattern. Since I didn’t feel like going to Hancock for this project I decided to see if I could find another pattern to help me hack the over all look. Enter Simplicity 1913. The bodice of this dress has similar princess seams and neckline as well as offers a choice of sleeve options (a requirement of the Sewing Bee). So first up, I made a few standard adjustments to the bodice pieces — 1″ FBA and added 3/4″ to the shoulder width. Then I graded out the peplum pieces from S1425 to a size 14 to match my bodice pieces. Next, I made a muslin and checked the fit. I needed to lower the bust point 1″ and add 1/8″ of width under the arm at the side seam tapering to nothing at the waist. I also needed to readjust the pleat placement a little bit. Other than that, the fit was good. Next, I used my muslin to determine how I was going to get in and out of this top. 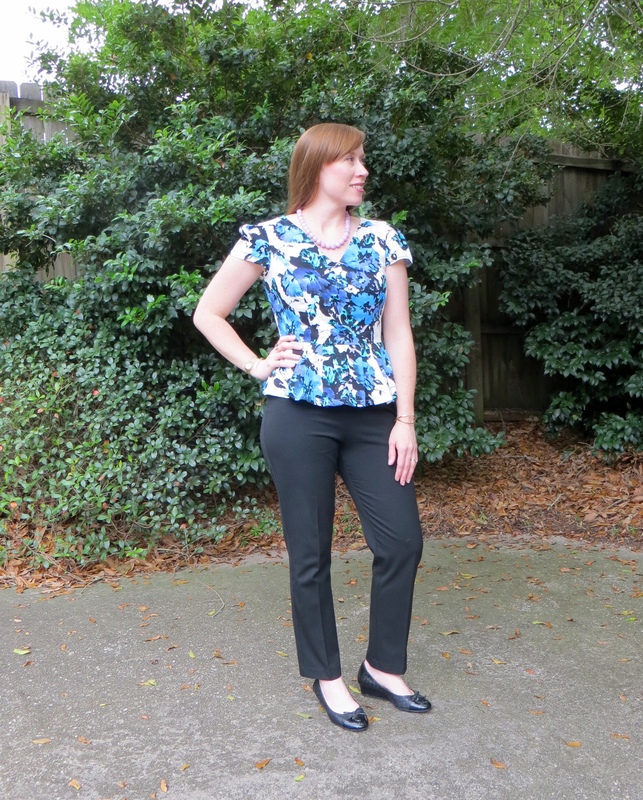 The original pattern called for just three little buttons spaced down the back of the blouse. I don’t know about you, but I am not keen on the idea of exposing my entire back and bra to the world. So I contemplated using a full button placket, side zip, center back zip, etc. I finally decided that an upside down center back zipper would be best. I started the zipper at the waist seam and extended it up 7″ (it ends a little above my bra strap). This makes it easy to get on and off over my head but still keeps the zipper pull within easy reach when trying to operate the zipper. Finally, I made a few style changes from the original pattern. 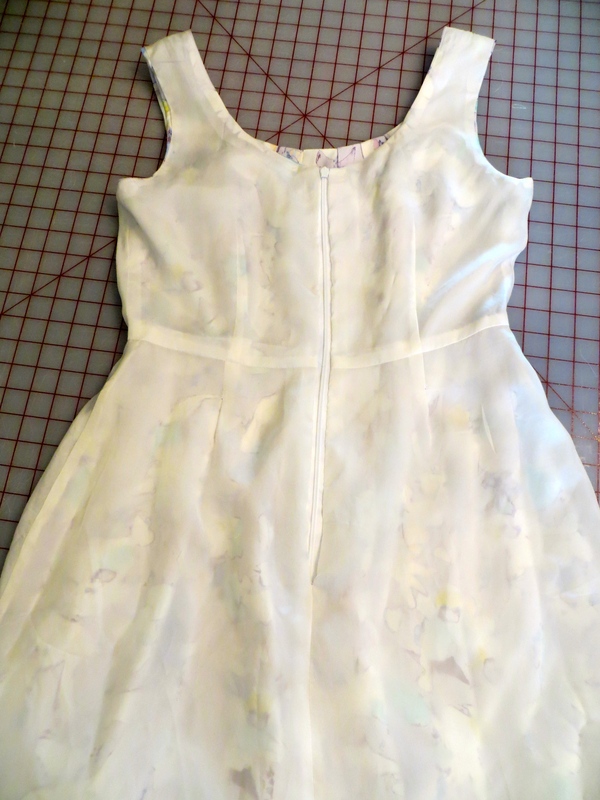 I cut a V neckline instead of the high round neckline because I felt like I needed to break up my floral fabric. 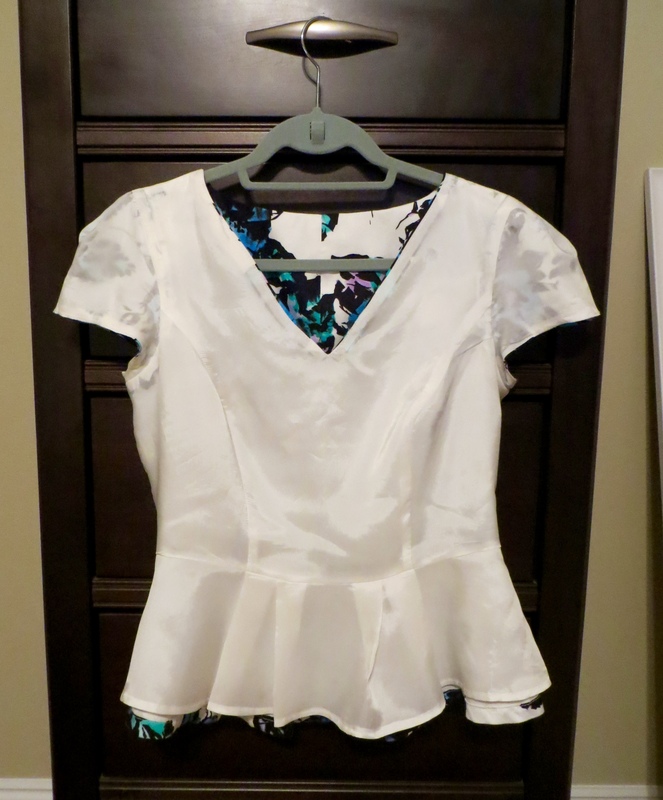 I also added some pleats to the sleeves to echo the peplum pleats and to add a little more ease to the sleeve. 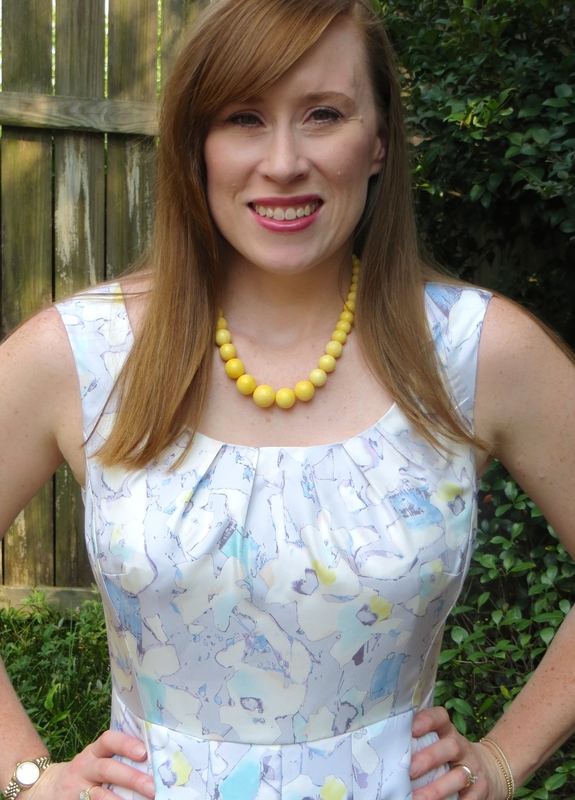 For my fabric I chose a rayon satin from Sawyer Brook (P. S. it’s now on sale!). It has the most luscious feel but is a little on the flimsy side so I decided to underline it with white cotton batiste which gave it the perfect hand. I lined the entire top in white rayon Bemberg. I love the colors in this top and I have a coordinating fabric picked out for the pencil skirt that I finally got the pattern worked out on. 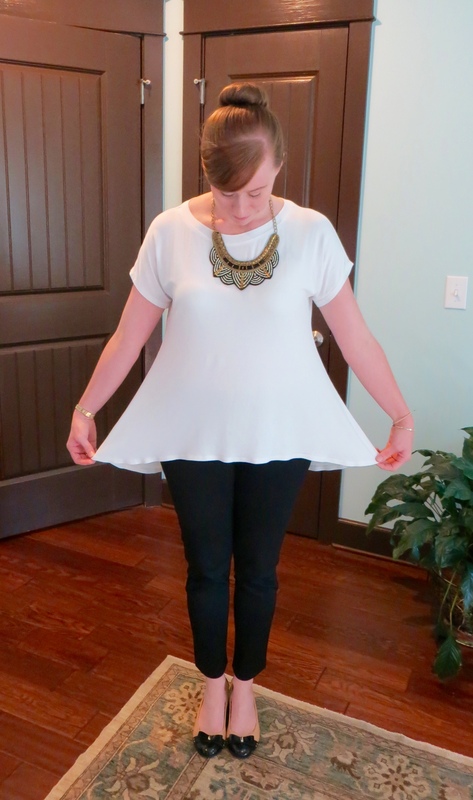 While sewing this top, I was methodical about grading, clipping, and pressing my seams and that was therapeutic for me. 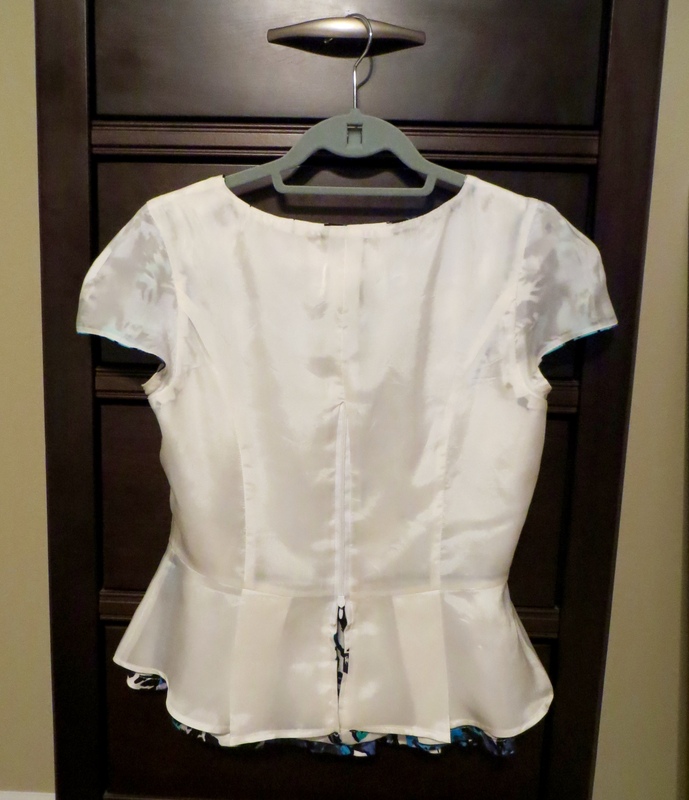 But I think the most rewarding part of sewing this blouse was the fact that I got it fully lined (even the peplum and sleeves), completely by machine. There was no hand sewing involved. 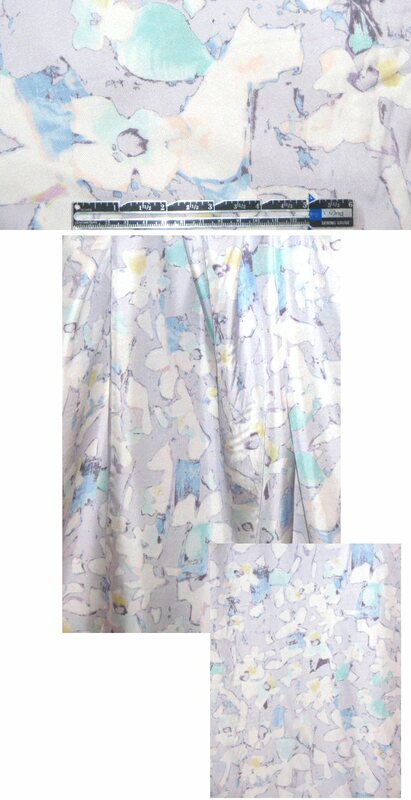 I have always machined my lining to sleeveless blouses and dresses but my Google search was coming up empty on how to machine the armscye lining seam in a sleeved garment. But after sleeping on it and brainstorming about it while working on the other construction of the top, I figured out a way to do it very neatly and cleanly. I can’t wait to test my method out on something with a longer sleeve to see if it will still work. If it does, I will post a tutorial. I am tickled pink with my top. I wore it to work today styled like the photos but I can also see myself wearing it with a black pencil skirt and heels or with jeans and booties.